ISSUES 101 recaps and updates some of the topics covered by the magazine in the past 25 years. 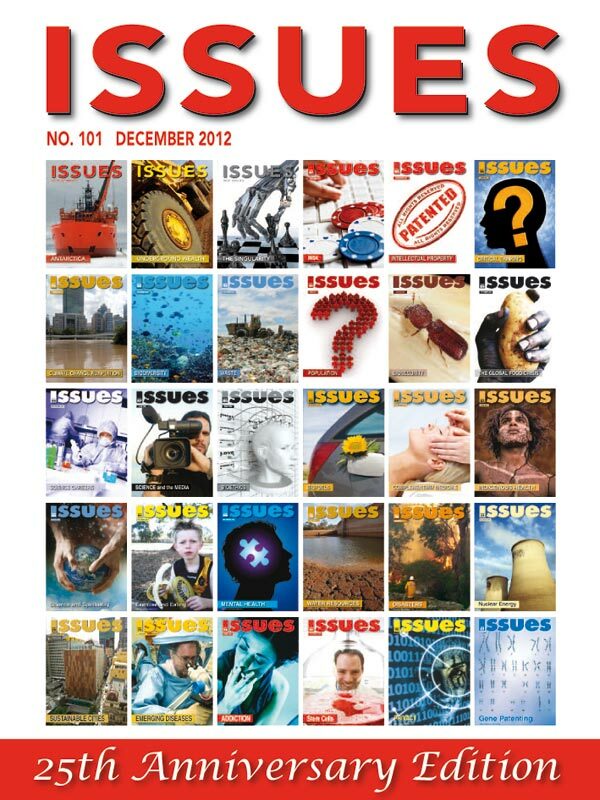 This year, Issues celebrates 25 years of publishing public debate on contemporary scientific issues. In this edition, some of our past authors have revisited a range of issues, highlighting new ideas or developments – and sometimes setbacks. Last year, Luigi Palombi reported in Issues 96 that the US Court of Appeals for the Federal Circuit had reversed a decision of the US District Court, concluding that isolated genomic DNA was patentable subject matter. This year the plaintiffs, Myriad Genetics, appealed to the US Supreme Court, which vacated the Court of Appeals’ decision. After a second decision by the Court of Appeals – in which the Court “was divided two-to-one, holding that the isolated BRCA genetic mutations were patentable” – the case is again destined for the US Supreme Court. “The controversy has raged for 20 years. I never expected it to. It was clear to me in 1993 that the patent system was being misused,” says Palombi of the battle over the BRCA1 and BRCA2 genetic mutations (p.4). The digital age has transformed privacy issues. Social media sites and smartphones are circulating personal information more freely than ever, and the consequences of not protecting this information can be significant, such as identity theft. “While 76% of 16–17-year-olds are aware of privacy settings, 24% of teenagers don’t know how privacy settings work,” says Australian Privacy Commissioner Timothy Pilgrim (p.8). Pilgrim recommends familiarisation with and use of privacy settings, updating virus software, thinking before posting and considering turning off the geolocator on smartphones. The Fukushima disaster has been by far the most prominent nuclear event since Issues published its nuclear energy edition in 2006. “Fukushima’s effects have been to reduce by single digit percentages the scope and scale of nations’ nuclear expansion plans and, in some cases, to defer the investments. But the fundamentals of nuclear power can still be attractive,” says Michael Angwin of the Australian Uranium Association (p.12). “Many of our regions are expected to become climatically unsuitable for our native fauna and flora,” says Ary Hoffmann of the University of Melbourne (p.14), who reminds us about the adaptive capabilities of living things. He says that genetic exchange (hybridisation), which is now recognised in plants and animals, should challenge the ideas we have about “preserving” species since they may need to exist in areas outside their usual habitats. “The threat of salinity may have been temporarily checked by drought and climate change, but its return is inevitable,” warned Ken Lawrie in Issues 78 in 2007. Revisiting this issue, Richard Price of the Australian National University reveals that “knowledge about salinity in the Australian context has basically been put on hold while other priorities are addressed within the constraints of limited science budgets” (p.18). Using an integrated science approach to salinity makes sense in some respects – salinity doesn’t happen in a vacuum – but “it’s something altogether different to have the infrastructure, managerial capacity and scientific methods to make the post-transition state work successfully”. A hybrid has emerged in the plastics industry, but Australian consumers don’t know or seem to be interested, says packaging consultant Michael Hubbert. In countries such as Brazil, some grades of plastic have components made of renewable plant material. Bottles made of such plastics hit the Australian market last year “with very little fanfare and even less acknowledgement by consumers,” says Hubbert (p.23). Of course, one of the issues arising here is that food crop-producing land is being usurped to produce the “plastics” crop. Hubbert uses Australia’s “plastic bag-free” town and a government-funded booklet to illustrate the ways in which we could be misinformed about plastics. In the global fisheries workforce, men are portrayed as the “lead actors” says Meryl Williams of the Asian Fisheries Society, despite nearly half of the workers in this sector being women. “Only by putting gender on the fisheries and aquaculture agendas will action be taken,” says Williams (p.26). Global discussion, and gender equity education, training and support, must be developed. Some of the issues of global food security recur, says Denis Blight of the Crawford Fund: meeting the food demands of a growing population, investing in rural infrastructure, and the importance of education and training. At its parliamentary conference this year, the Crawford Fund recommended looking at ways in which the private sector can be involved: “The private sector is interested in emerging markets; some major agrochemical companies have targeted investments in Africa,” says Blight (p.29). Relationships between agriculture and industries such as mining should also be considered. “In 2007, there were dire predictions that we were losing the [childhood] obesity war,” says Tim Olds of the University of South Australia (p.34). However, he and his colleagues have reported a plateau in obesity rates in Australia, and similar indications for adults. Several reasons for this have been postulated, including sampling influences and the effectiveness of media messages. Another recent and surprising development is the “obesity paradox”: overweight people are now reported to have a lower risk of dying than those of normal weight. Health costs are higher for overweight and obese people, so it has been suggested that they now live longer because they receive better care. “A recent Australia21 report … was scathing of the current policy of prohibition and criminal sanctions for drug users. It called for a reopening of the national debate on the regulation and control of illicit drugs,” says Senator Richard di Natale (p.37). The current climate saw it dropped like a hot potato, he comments. The reasons, argues di Natale, include the rising power of opinion polls, which are now used to determine reforms rather than to gauge them; low diversity of media ownership; and the ability of lobbyists and individuals to mount strong campaigns in short timeframes. The Vice President of the Australian Skeptics, Rachel Dunlop, expresses her dismay at the “caving” of the Therapeutic Goods Administration’s proposals to regulate the complementary and alternative medicines industry in the face of an industry outcry. “Thus [the government] will continue to lend legitimacy to products for which there has likely been no evidence presented nor any tests for efficacy performed,” she says (p.40). Genetic mutations are a specialty of influenza viruses: seasonal changes to their surface antigen genes provide a challenge to health authorities, and to vaccine researchers and manufacturers. Greg Tannock of RMIT University says of his 2006 Issues article: “ I … conjectured that if critical changes to the avian virus genome took place, the [H5N1] virus could develop a capacity to rapidly spread in the absence of a bird host (i.e. to become humanised)” (p.42). Fortunately, he says, such changes have not yet become a reality. Seasonal influenza, unlike common respiratory viruses, can produce infections of the entire respiratory tract, with serious and sometimes deadly consequences. “Last year, the 2005 moratorium on xenotransplantation in Australia was lifted by the National Health and Medical Research Council, but there is little likelihood of such trials taking place in Australia in the near future,” says Bob Elliott of Living Cell Technologies (p.45). His company is currently conducting clinical trials in New Zealand, transplanting pancreatic islet cells from a special herd of disease-free pigs into humans. The cells, which help recipients who have type 1 diabetes to regulate their blood glucose, are encapsulated so that the body does not reject them. Results to date are promising, and the company is looking to expand its technology to the treatment of neurodegenerative diseases such as Parkinson’s disease. This year, the Nobel Prize for Medicine was shared by two researchers on stem cells, the topic for Issues in December 2005. The discovery by one of them that it was possible to reprogram cells from mature mice to become immature stem cells stunned the scientific community and allayed concerns about embryo destruction in one fell swoop. The applicability of this to human cells was confirmed by separate researchers in 2007. “Nowadays, the fever over human embryonic stem cells in the early Noughties seems faintly ridiculous,” says Michael Cook, editor at bioedge.org (p.47).